Home » Blog » Can Fish Oil Supplements fight Type 2 Diabetes? Diabetes mellitus type-2 is a growing problem in modern societies. Sadly, it's a trend that shows no signs of slowing down. This is a long-term metabolic disorder too. So how can fish oil (FO) help in this area? Well, we know that FO supplements can create a modest increase in the amounts of a certain hormone called adiponectin. This is a substance that's associated with a reduced risk of diabetes and also heart disease. Adiponectin works by having an effect on metabolic processes like the modulation of chronic inflammation and glucose regulation. In this video, Dr. Richard M. Moe, MD, PhD, explains in some details how taking Omega-3 fatty acids can assist a diabetic's health. Like so many of these studies, the findings of this research are not yet large-scale enough to deem conclusive. Yes, higher levels of adiponectin in the bloodstream have links to a lowering risk of type-2 diabetes and heart disease. And yes, fish oil moderately increases adiponectin levels in human blood. But the true influence of fish oil supplementation on glucose metabolism, and the actual development of type-2 diabetes, is not yet clear. So far, research leader, Jason Wu, PhD (Harvard School of Public Health) suggests there is a “potential benefit” of FO consumption on blood glucose control and also fat-cell metabolism. There are so many health benefits for taking fish oil supplementation, and there will probably be more to come. This is an exciting and interesting field of study, especially at a time where entire populations need something to help get them into a better physical and mental state. Fish oil, it seems, can do a lot to help in all kinds of health-related areas. This probably explains why over 40 percent of all adults and 32 percent of all children (rough estimates) in developed countries take omega-3 supplements. Effect of fish oil on circulating adiponectin: a systematic review and meta-analysis of randomized controlled trials. | Wu JH, Cahill LE, Mozaffarian D.
Krill Oil Helps with Weight Loss – True or False? 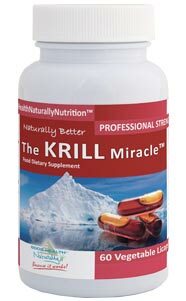 Krill supplements are thought to help with weight loss and weight maintenance. The science is ongoing but so far the results are encouraging.